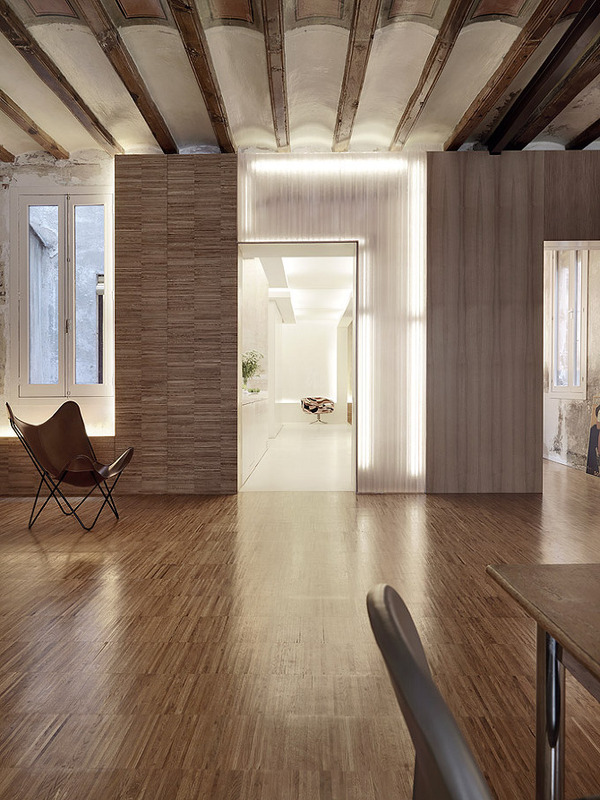 The project is our flat in Barcelona in the Gotico area, in the center of the historic part of Barcelona. A challenge was the very heterogenic floor plan, which was interrupted by various light patios. The other issue is little daylight in the old town of Barcelona, as the sun and the heat were considered rather a burden in the old times. Crossing two programs = the white cross. The invention was to cross two programs: the kitchen and the bathroom, two brightly light up white spaces, forming a white cross. The white cross we put between those medieval walls and created a bright center in the middle of these fragment spaces and light patios. The crusch alba (white cross) is a crossing of two programs, there is no circulation, no matter where, you are either in the kitchen or in the bathroom. The rest of the space, the walls and ceilings are left in its original state: raw stone walls, wall paintings and raw plaster finishes. Intervention of layers - pictures of the old times. 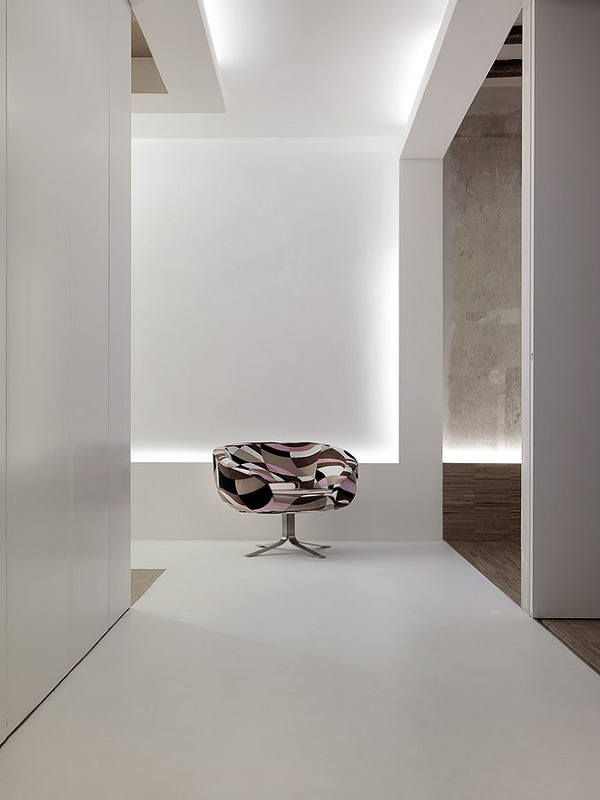 We implemented the white cross as a new volume in the existing space and created openings into this white space. We light up the periphery: the border between old an new. In that respect, the layer outside of the white cross becomes the outer space, generating pictures of ‘the old times’ like looking outside a window into another landscape. By coincidence, real windows appear in these openings. 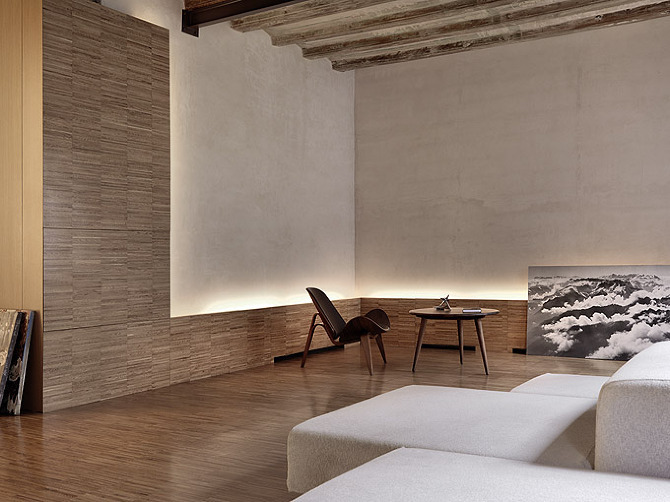 We left all the old surfaces in the original state, just varnished them: painted ceilings, painted wallpapers, raw old stone walls of the Gotico and even raw plaster of the new building interventions. The overlay of layers of old and new with light in between emphasizes the lack of hierarchy of old and new. It’s the feeling of not finishing; keeping it urban and letting the process and time be visible that gives a feeling of freedom. Space Machine – the spaces are not defined by walls, floors or volume. The apartment can be used as loft or as a three bedroom apartment. The white cross is physically and visually the center core of the back part of the apartment. The actual bedrooms and the bathroom can be divided by big sliding doors and are not defined by the cross itself. So the master bedroom space is part of in the white cross and part of the remaining old space (old layers). So the actual rooms are urban spaces, as they are part of various elements. We dissolved the original wall into a sequence of elements, so that the openings become in between spaces of things touching, rather than holes in wall. So the separating element becomes the connecting element, an attractor brought to life by light.